Brad recalls the days of Elemental's rough launch, what we learned from it, and how we did our best to make it right for all of our future games. Check out Episode 3 in Ars Technica's "War Stories" series here. And I wait in coming hope for a 64 bit sequel to the elemental series that will realize the original vision it had. I've logged onto these forums for the first time in 8 years just to say "Me too, man, me too." I had such high hopes for that game. It's ashamed how it all turned out. Anyone who actually participated in original Elemental alpha/beta should remember memory issue / crash is just one of major issues the game had. I would say the memory issue was not even a priority issue at all. Game features were simply non-functional from the first place, even before we are talking about the memory issues and crashes. Like, basic things such as auto-save (yes, this is still broken and still un-fixed nor recognized as bug, to this date). Basic pathfinding did not exist, nevermind about AI in general. The fact is that even if you guys had zero problems with memory issues and had absolutely no crashes, there was no way the game was ship-able condition. Yes, like, every single person in tester forum told you guys to NOT release the game, because the game was not even functional in purely gameplay perspective, not just technical perspective. But you guys released the game anyway. And we are here. And based on comments at Ars, It is not just me who remembers what actually happened to Elemental. And unlike what you said, Brad, at that time, we already suffered similar issue with previous game. Remember Demigod? I still remember you permanently banned one forum member and revoked his game license because he cried too much about the multiplayer was unplayable and broken. Yes, that crazy multiplayer system made by Stardock that was never fully functional til very end. That said, the last game I ever bought from you guys was Galciv 3, and I still have no intention to spend further money to your company. MAYBE, MAYBE I make exception for Sins of Solar Empire 2 if it ever comes out, but that's it. At least, the iron dragon figure what was included in Elemental Collector's Edition is cute, thus it is still on my desk, for more than a decade, reminding me of one unfulfilled game I liked. I mean, those of us who bought it back in the day still have it for download, last I checked. I remember reinstalling it back in 2015 to check on some mod stuff for FE, started it up for fun and E:WoM sure was garbage all the way through. But FE:LH was a good game bordering on great, and I think early E:WoM buyers got it for free along with FE. So I think I came out of all that pretty damn well, I just had to wait a couple more years. It's been really long time, Heavenfall. How's your modding on No Oxygen Included? Yes, they were doing great, until we got this Sorcerer King. I don't know, I guess we can say LH was a good game because of the sheer amount of contents, but the basic elements are severely lacking and bugs. I mean it still frustrates me that Auto-Save is still completely broken since the first Elemental came out. Not to mention every time I load the game diplomacy modifiers reset, thus suddenly a country which hated me so much suddenly in love, and vice versa. 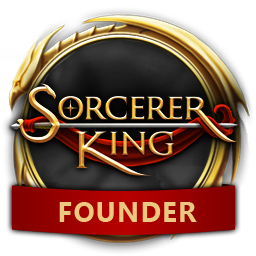 I have no idea how Stardock thought Sorcerer King direction would be any good. It turned out people care less about having real dwarfs but care far more about having actual 4x experience with unique RPG elements. I can't deal with the frustration anymore. I play 120 turns or so on Epic pacing to find a stagnant AI that has done a face plant. The character progression and monsters are the only interesting things. They're very interesting, but I can't play a game without an opponent. I don't consider the ZOC bug many players go on about game-breaking. I'm rather sad about this game. So enjoyable, but it frustrates more than fulfills.